I have always felt that zoning regulations are an insidious evil that have caused our communities to be built in ways that are impractical and, well, unpleasant. It doesn't make sense to completely separate uses, so that we end up with huge strip malls and housing developments without shops or sidewalks. That's why I'm excited to learn about a viable alternative, called form-based code. The idea is to regulate the form, rather than the use, of properties. In other words, you can put any kind of use in a building, as long as it visually and functionally fits in with the neighborhood. While it wouldn't necessarily make sense to put a Starbuck's into a house in a suburban neighborhood (hmm... maybe that's not such a bad idea ;-), if you allow a little flexibility in visual design then different uses can be very compatible. Even more important, they can be synergistic. Form-based codes are being proposed for the north Airport boulevard neighborhood in Austin, and I support it. Spread the word! 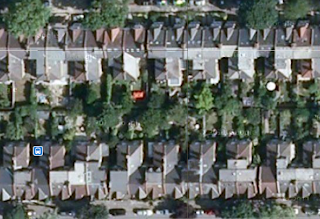 Note that it has huge stand-alone houses that almost completely cover the available space. The alleys are a nice touch, but they aren't very efficient in terms of space. The houses are so close together that you could almost reach out one window and touch the other building. 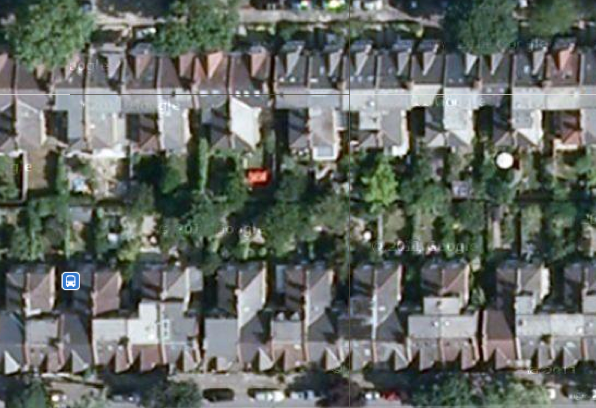 Consider this analogous random chunk of suburban London. The houses are touching! But that leaves more room for a back yard. Maybe its just me, but I would rather have my house touch my neighbor's house and have some open space. Having the houses touch actually gives more room for windows that you want to look out. The American style might have more windows, but there is less view. I am not sure exactly who to blame... It could be the American architects, planners, and builders. It is partly their fault. But in the end they build what American buyers want to buy. And those buyers are not very rational, I fear. On Tuesday I gave a tutorial on partial evaluation, called "Build your own partial evaluator in 90 minutes" at the working conference on domain specific languages (DSL 2011) in Bordeaux. The lecture notes benefited greatly by help from Ralf Lämmel. I've given this talk a few times before, but have not suggested that the audience actually implement a partial evaluator during the tutorial, as I did this time. Several people complete the task during the talk, and many more completed it in the following few hours. Solutions were done in Haskell, Rascal, and Scheme, and maybe more languages. Working in Scheme, Ludovic Courtès finished the code that evening. He then checked it in to the code base of the GNU Guile compiler. I suspect that it needs a little more engineering to make it completely robust, but there is nothing that can't be taken care of with a little care. This is a very fun example of practical impact: lecture to deployment in less than 24 hours. Thanks to everyone who attended, and to Ludovic for his extra efforts!